If your PC fails to boot with the "Error Loading Operating System", then you can fix it in a few minutes using Emergency Boot Kit. This article explains how to get rid of Error Loading Operating System. Repair this boot issue quickly and easily by recovering the boot sector. BIOS loads 1st sector from HDD (Master Boot Record), verifies 55 AA signature and transfers control to Master Boot Record. Master Boot Record scans partition table for active partition, then it loads 1st sector from active partition, verifies 55 AA signature, and transfers control to Boot Sector. Boot Sector loads 15 additional sectors from the beginning of disk (Volume Boot Record) and transfers control to first additional sector of VBR. 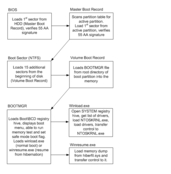 Volume Boot Record loads BOOTMGR file from root directory of boot partition into the memory and transfers control to it. BOOTMGR loads Boot\BCD registry hive and displays boot menu. BOOTMGR is able to run memory test and set safe mode boot flag per explicit user request. But normally, it loads winload.exe when computer boots normally (cold startup) or winresume.exe (when computer resumes from hibernation). Winload.exe opens SYSTEM registry hive, gets list of drivers, loads NTOSKRNL.exe, loads drivers (*.SYS files) and transfers control to NTOSKRNL.exe. Winresume.exe loads memory dump from hiberfil.sys and transfers control to it. 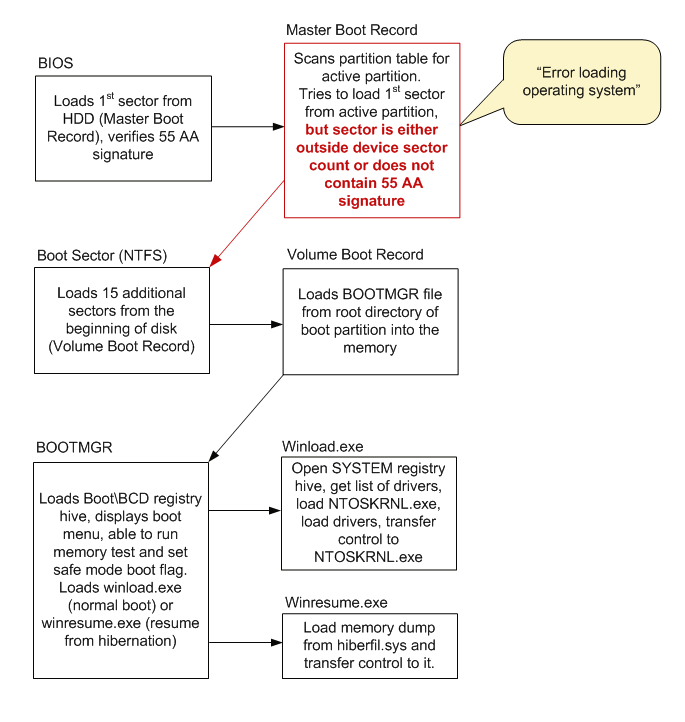 Master Boot Record scans partition table for active partition. There is one active partition, so Master Boot Record tries to load 1st sector from active partition, but sector is either outside device sector count or does not contain 55 AA signature. So MBR emits "Error Loading Operating System" error message and halts machine. The rest of usual boot events do not happen. 1) Download Emergency Boot Kit and deploy it to USB thumbdrive according to the instructions, then set up your BIOS to boot from USB thumbdrive. You need full version of Emergency Boot Kit to actually write changes to the disk, but it's recommended to try demo version to make sure there are no hardware incompatibilities. 2) Boot from Emergency Boot Kit, wait until the main menu appears. 5) Click OK to close the window and then choose "Reboot" in the main menu. 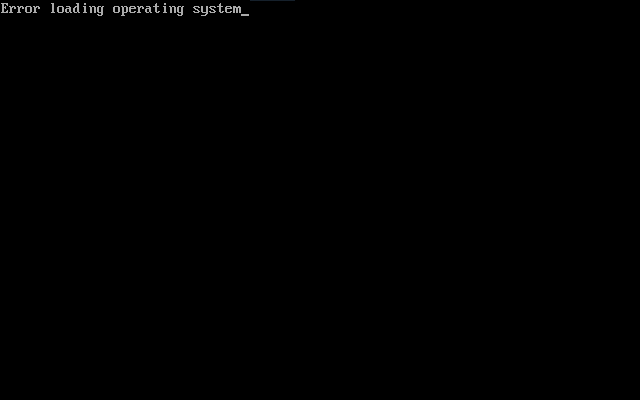 'Error Loading Operating System' boot problem is fixed now. 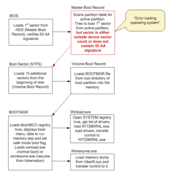 Please note: Mount & Boot Center verifies entire boot path from BIOS to the OS boot loader, so other boot problems may be automatically fixed at this point.